To celebrate the theme of their brand new ‘We Know the Feeling’ ad campaign, the Mecca Bingo team are going above and beyond to give as many people as possible that one-of-a-kind winning feeling. Cash Climber is one of many amazing promotions being offered at Mecca Bingo throughout the month of October. Every Friday you can ‘climb’ up a series of bingo games to grab your share of a jaw-dropping £40,000. 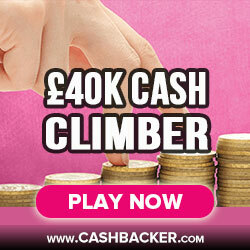 Think of Cash Climber like a ladder with a massive cash prize at the very top, just waiting to be won. The higher you climb, the bigger and better prizes you’ll come across. The games begin at 6pm every Friday in bingo rooms that are part of the promotion. Join in this first game and you’ll find ticket prices are 10p and the top prize on offer is £100. After that a new game begins every hour on the hour. If you stick around, you’ll see that the jackpot prize increases by £100 every hour and the ticket prices are doubled from 8pm onwards. The last games of the night take place at 10pm and boast top prizes of £500. As if all of this wasn’t generous enough, some of the bingo games which are active during the Cash Climber session also have pots of bingo bucks from Mecca Bingo’s Win Win promotion up for grabs. So make sure you keep your eyes peeled for these extra treats. The Cash Climber promotion sprung into action on the first Friday of October and will be taking place every Friday throughout the month. The sessions last from 6pm until 10pm. For your chance to win one of these ever-increasing cash prizes, all you have to do is buy your tickets and begin playing. As long as you reside in England, Scotland or Wales and have an active Mecca Bingo account, you can play for your chance to win in the Cash Climber promotion. If you’re not registered with the site yet, make sure you create an account in time for this Friday’s session. If you are a Mecca Bingo member, all you have to do is sign in and start playing. Make sure you remember that on Friday the 28th of October, the overall prize pool will be slightly less due to the Rank Cares charity games that will be taking place in other bingo rooms on the website.